Paro Taktsang (spa phro stag tshang / spa gro stag tshang), is the popular name of Taktsang Palphug Monastery (also known as The Tiger's Nest), a prominent Himalayan Buddhist sacred site and temple complex, located in the cliffside of the upper Paro valley, Bhutan. A temple complex was first built in 1692, around the Taktsang Senge Samdup (stag tshang seng ge bsam grub) cave where Guru Padmasambhava is said to have meditated for three years, three months, three weeks, three days and three hours in the 8th century. Padmasambhava is credited with introducing Buddhism to Bhutan and is the tutelary deity of the country. Today, Paro Taktsang is the best known of the thirteen taktsang or "tiger lair" caves in which he meditated. The Guru mTshan-brgyad Lhakhang, the temple devoted to Padmasambhava (also known as Gu-ru mTshan-brgyad Lhakhang, "The Temple of the Guru with Eight Names") is an elegant structure built around the cave in 1692 by Gyalse Tenzin Rabgye; and has become the cultural icon of Bhutan. A popular festival, known as the Tsechu, held in honour of Padmasambhava, is celebrated in the Paro valley sometime during March or April. 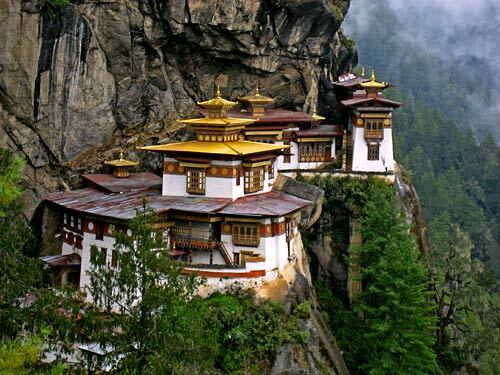 woww,, that's awesome,, great cultural place of Bhutan?